I recently visited Nordstrom's Estee Lauder counter at The Mall at Short Hills, to find my perfect foundation shade with Estee lauder's imatch system. The whole experience was part of a Glambassador project which I was happy to participate in, with positive, satisfying results. Finding the perfect foundation shade has always been trial and error for me, but finding my shade this time had a more systematic approach. The first step in the imatch system is to find your intensity level, which indicates the varying degrees of your skin color, from light to dark. The next step is to use the shade finder to determine what skin tone you have - warm, natural or cool. After determining that I have a warm skin tone with a golden cast, I was asked what my skin concerns were. I wanted a foundation that had a natural look and feel, definitely not thick or oily. After determining what type of foundation worked best for my skin and needs, the shade finder tool was used to match my facial skin tone against the varied shade levels. 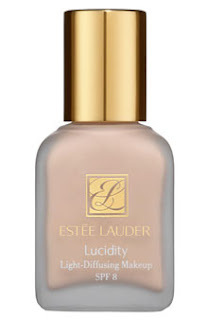 I ended up with the Lucidity Light-Diffusing Makeup in the Golden Caramel shade. It has a natural, smooth finish and is fragrance free. It has SPF 8 with some light moisturizing benefits, great for my combination skin. I like the fact that it doesn't feel oily. My beauty advisor, Susan Alexander had applied the foundation using a foundation brush. I must say I've never used a brush to apply foundation, but have been using one ever since. When I asked Susan what the benefits are to using a brush, she had explained the brush allows the foundation to blend evenly, without any streaking. She shared some tips on how to apply the foundation - dab a small amount on different areas of your face and use the brush to blend in a downward motion. So I left with a 10-day supply of my imatched foundation, along with a sample of Idealist to apply on clean skin before moisturizer. Thank you Susan for being such a helpful, informative beauty advisor! You can go through the imatch steps online at esteelauder.com, but I encourage you to go visit your nearest Estee Lauder counter for a full, personalized experience. It's still important to test the shades on your face to find the best match. Taking home a sample of the foundation first is always a good idea, to make sure it's the right coverage and that you don't have any allergic reactions.